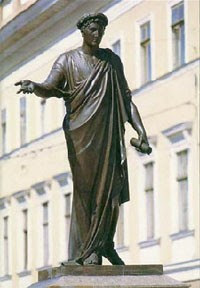 Osip Deribas is traditionally seen as the founder of the city of Odessa but, much as he did to make the city happening, it was still Duke de Richelieu who made this Southern Palmyra one of the best known cities in the world. In 1803 Duke de Richelieu turned 37. The scion of the legendary French family, he had received excellent education at an exclusive college named after his famous great-grandfather. At 21 he was already a senior officer in a Hussar regiment and a familiar face at the Versailles. The Great French Revolution turned his life all around and forcing the young Duke to seek a better lot abroad. Leaving behind a family estate and a plain looking hunchback wife, Rosalie Sabine, he had married six years before, Richelieu moved to Russia. There, by a whim of fate, he found himself storming the Turkish fortress Izmail. By a similar whim of fate he survived the carnage and slightly wounded, was awarded a golden sword for valor. Looking through the list of Izmail heroes, Empress Catherine II caught sight of the legendary name, had its owner ushered in and charmed by the young French officer allowed him to attend exclusive soirees she was regularly holding in her palace. Catherine also saw de Richelieu as someone who she believed would save France. With a handsome sum of money given him by the Russian Empress, the Duke joined the royalist army of Prince de Conde to fight the Republicans. Two years later the war was lost. The Russian money did not help the royalists. Disappointed as she was, Catherine still allowed de Richelieu to continue his service in the Russian army. Start following our trades today and gain up to 270% a day.